Handicappedpets 30 day return policy was designed to give you and your dog a chance to try the wheelchair, and return it if it does not work. If you’ve exceed the time period, though, we have provided a way you can still get most of your investment back on our UsedDogWheelchairs.com website. The website is free, and customers have a great deal of success selling their chairs quickly and reliably. If you have any problems posting an ad, click here to see our FAQ page. We encourage you to add an image of your ORIGINAL product to an ad. Please do not use stock photos from other companies websites. These will be removed when uploaded. Images types include: gif, png, jpg. The file size limit is: 5120 KB. You may post up to 3 images on each ad. 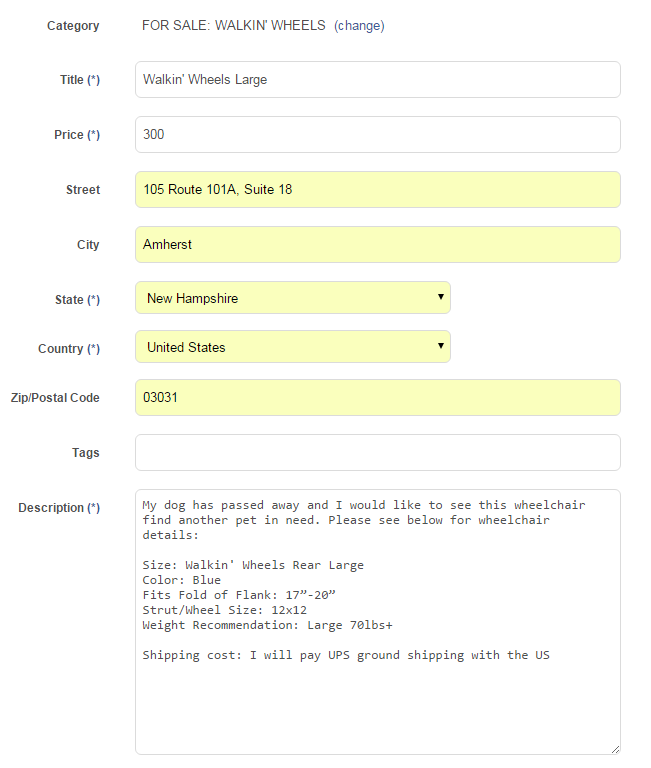 Useddogwheelchairs.com provides a gateway between seller and customer. We do not handle any form of payment or shipping. We highly recommend the use of Paypal as payment and UPS as shipping. Please feel free to contact us with any questions you may have. Your story: What is your pets story? Why are you selling it? Shipping Cost: The person that is interested in your wheelchair will contact you to arrange payment and shipping. If you need to quote shipping, use www.ups.com and go to the calculate cost tab. You will need to put in the zip code of the person you are shipping the wheelchair to.